BOSTON (AP) — Chris Sale waited eight years to make his first postseason start and then another 365 days for a chance to put that memory behind him. He’s thought about it. He’s learned from it. And he wants to make sure he doesn’t make the same mistakes again. “Last year, obviously, I got my feet wet. Didn’t do too well. 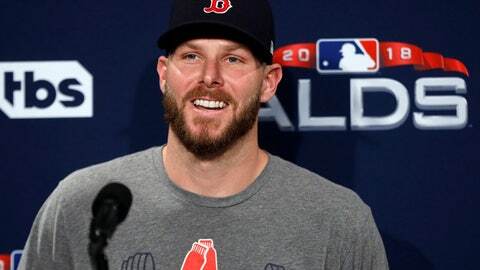 But sometimes you learn from the bad more than the good,” Sale said Thursday, a day before the AL East rivals open their best-of-five series. A seven-time All-Star who was the ace of the White Sox staff before coming to the Red Sox in 2017, Sale had never pitched for a playoff team before starting the opener of Boston’s series against Houston. He gave up seven runs in five innings; he pitched well in an emergency relief appearance in Game 4 but couldn’t keep the Astros from advancing. On Friday night, Sale will face Yankees lefty J.A. Happ in the first-ever meeting of the teams in the ALDS. They have not met at all in the postseason since Boston’s epic comeback in the 2004 AL Championship Series before the Red Sox went on to win the World Series and their first title in 86 years. “This is everything we show up for,” Sale said. “We don’t play the game for anything else. Personal stats, wins in the regular season are obviously what get us here. And winning games and winning the division and having the record and all that. We appreciate it, don’t get me wrong. We worked hard for that. We grinded for that, and we earned it. After partying into the night and then riding what manager Aaron Boone called “a slow-moving train” to Boston, the Yankees decided not to work out at Fenway Park on Thursday. Sale is still recovering from left shoulder inflammation that landed him on the disabled list twice in the second half of the season and limited him to 12 innings from July 11 until Sept. 11. He made four starts down the stretch as he tried to build up arm strength, but in his previous outing last Wednesday his fastball was the slowest he’s had all year. Sale adjusted his preparation because of rain Tuesday, pushing back some of his work to Wednesday so he could pitch off a regular mound instead of in the batting cage. Manager Alex Cora said Sale is “a full go,” and the problems with his velocity were related to his mechanics and not his health or arm strength.